The God's Tooth provides a unique flexibility in adjusting to various water conditions. The hook can be detached from and attached to either end of the God's Tooth. The angler can make this adjustment to determine the appropriate action and presentation desired based on the water conditions and one's own preference. For Faster Action: Attach the Gamakatsu hook to the wide end of the lure. 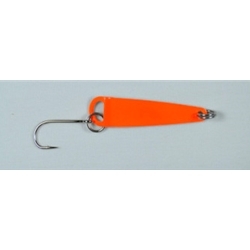 For Slower Action: Attach the Gamakatsu hook to the narrow end of the lure. The God's Tooth can be casted and retrieved, trolled, or jigged. Additionally, an ideal presentation is to cast out, pull the line tight, then drop the rod and begin reeling the line in until tight then pull again repeating the process. Also try casting out and begin retrieving with a slight twitch every few seconds. It is recommended that the angler possess a number of God's Tooth spoons of different colors and patterns as it is critical to find out which color or pattern the fish are interested in on that particular day. In order to improve casting distance or increase the depth of the God's Tooth, it is highly recommended a split shot and a swivel be attached 3 to 4 ft above the spoon in most cases. In water 5' or less, a split shot may not be necessary but we always recommend a swivel be used between the main line and leader. All God's Tooth are 1.5" in length and weigh approximately 1/10 oz.